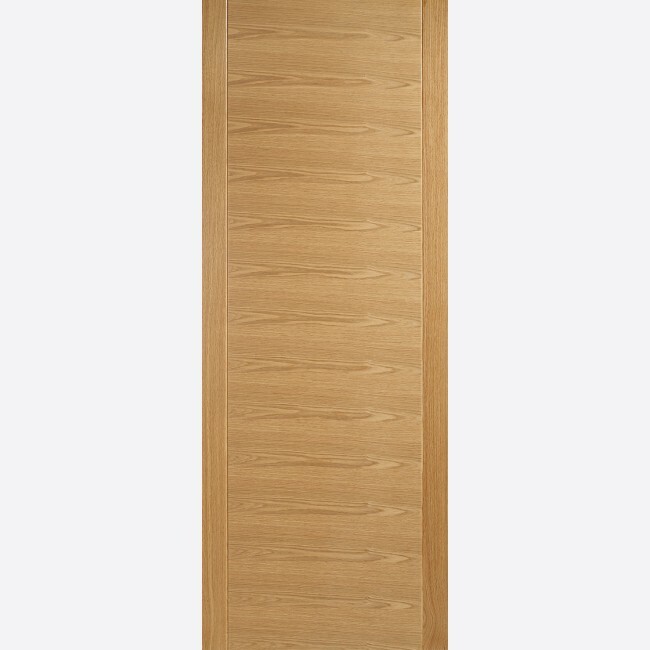 A contemporary door with Ar­­­­chi­­­­tec­­­­tu­­­­ral feature and door stiles, this door has a large central horizontal grain panel design, with vertical grains on the stiles,­­­ which perfectly compliments many of the oak doors in the range. Modern 44mm internal white oak fire doors are constructed from engineered solid oak timber components, to give more stability to the final door product, and reduce any problems such as expansion, twist and warp, that ordinary timber components can have. Oak Aragon Fire Doors are manufactured from engineered door components which can include MDF, particle-board and laminated timber. - Oak is a natural material - variations in colour and grain should be expected - They are not defects. LPD Oak Aragon Fire Door Codes - ARAOAKFC27 - ARAOAKFC30 - ARAOAKFC33 - must be treated to manufacturer's instructions. Modern Glazed Doors all incorporate an easy clean, laminated frosted glass or linea toughened glass as standard with the added benefit that the Oak door also has a FD30 firecheck Fire Door variant. - It is the Purchaser's Res­­­­­pon­­­­­sibi­­­­­litiy to Check the Suitability of These Fire Doors &­ Cer­­­­­ti­­­­­fica­­­­­ti­­­­­on, in Conjunction with the Door-Surround, Hardware & the Situation of Use. - We cannot exchange Oak Aragon Fire Doors after order - LPD Aragon FD30 Pre-Finished Oak Fire Doors are supplied as a Special Order. E. & O.E. see T&C - We do try to keep prices and specifi­­­­­­­­cati­­­­­­­­ons of LPD Aragon FD30 Oak Fire Doors correct, but mistakes can be made!